Get Rekt in Paladins! Plus Rekt code giveaway! Champions, it’s time to get Rekt! Paladins Open Beta Patch 50 has arrived, and it has brought some goodies with it. OB50 is bringing us lots of changes and new skins to unlock. The most surprising is the set of weapons that resemble Nerf guns. Since players requested certain champions to be nerfed, Hi-Rez delivered, though not as expected. The Rekt weapons actually shoot darts that stick to walls and have unique sound effects as well. Players can unlock Rekt weapons for 9 champions which are: Androxus, Barik, Buck, Cassie, Grover, Kinessa, Sha Lin, Tyra, and Viktor. There are also 3 new skins to unlock: Sha Lin with Vigilante and Guardian skins which make him appear like a superhero. Evie with Star Glam, which makes her appear like a space rock star. And Buck with Buck Wild, which makes him appear as a wrestling champion that sorta resembles the Rock. Sha Lin and Buck even have an available Voice Pack to match the skin. There are a ton of game tweaks and bug fixes, as well as a new test map Bend. You can read the full patch notes here and view the Patch 50 Overview below. But that’s not all! We’ve teamed up with Hi-Rez and are giving you a chance to get Rekt! We’re giving away a 3-pack of codes for the following: Tyra REKT Carbine, Viktor REKT War Rifle, Androxus REKT Hand Cannon! 9 lucky winners will receive a set of codes that will unlock each of those weapons so you can start humiliating your foes with darts! In the comments below, let us know which Champion you would like to stick with a dart and why. 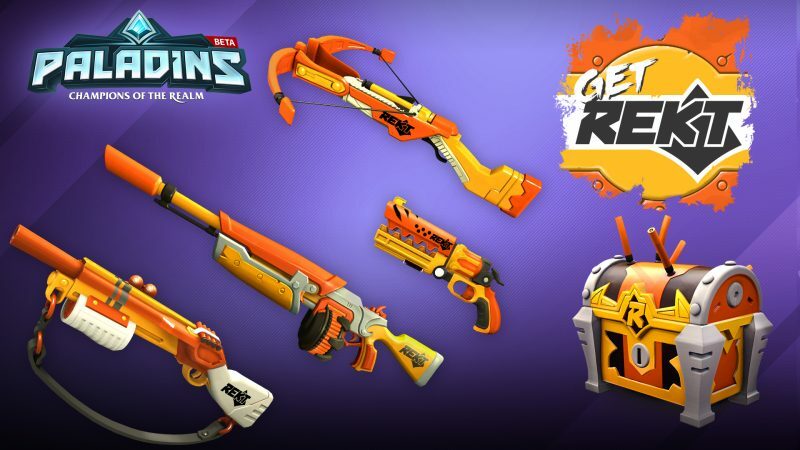 9 winners will be chosen at random and will receive a set of codes that’ll unlock the REKT weapons for Tyra, Viktor, and Androxus. Codes are valid only for the PC version due to the patch not yet released on consoles. Contest deadline is Friday 5/26 11:59PM PST. Winners will be announced by Monday 5/29. Good luck, champions, and I’ll see you in the realm! Gamer since '86, well knowledgeable in movies and games, and semi tech savvy. Graphic artist and t-shirt printer for over 10 years.